A lot of country in the west and northwest seems to be back country, those areas inhabited more with animals than humans, hence the title. 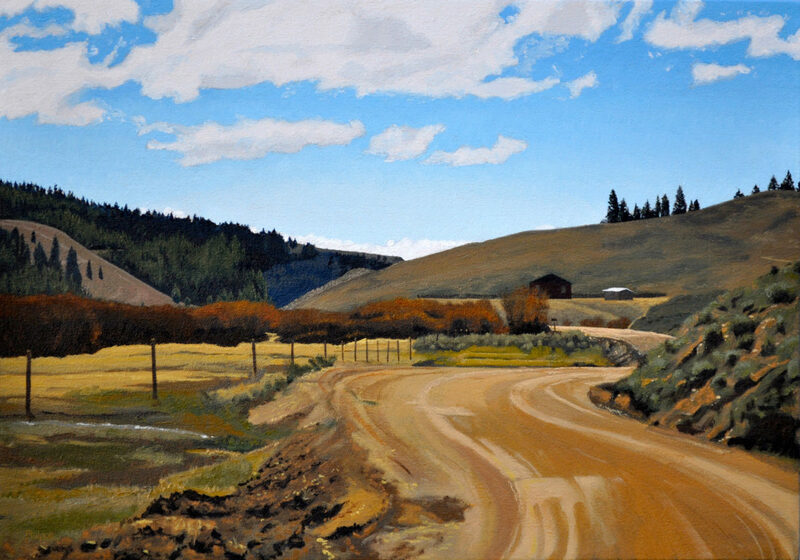 I like cruising back country roads looking for unique or unusual scenes from which I derive my oil paintings. This view attracted me because I found that one house on one dirt road out in the middle of nowhere somewhere near Fairfield, Idaho. I thought that there was a hopeful connection to humanity by including the tiny mailbox in the scene. Otherwise, I liked the bright blue skies over the country side and its offering of hope for a new spring and summer season. Landscape painting can be very abstract when you get to rendering barren hills, plowed dirt, rocky outcrops and the general foliage etc. Back Country had all of that going on. I’ve found that trusting the layering process usually works out. I start with a wash layer, followed with direct paint and glaze layers to produce the best results. The glazing of an area will unify the colors that were applied directly. I follow glaze layers with more direct paint to achieve the desired effect.